Gardner: As you looked to extend the benefits of server virtualization, what were some of the top requirements for moving to cloud and hybrid-cloud infrastructure? Pazos: We're an IT department for a mid-size town in Massachusetts. We offer services to all of our internal departments, and we're beginning to grow out into a managed-service provider. What we're doing now is providing these services to other cities and towns. The way that municipalities are run, especially from an IT perspective, there isn’t a great deal of diversity. We could pretty much run IT for almost any city or town, because the apps are very similar and the business processes are all very similar. And after the launch, actually one of the things that we are pretty excited about that we didn't see in the past was cost predictability, which we don't really see a whole lot from a lot of the other service providers. Cousens: When you get some practice consolidating city and school networks and data centers you realize it's all the same thing. We could do it with other the municipalities as well. Gardner: What was important for you to be able to do that in terms of the infrastructure solutions available? Pazos: Part of what we're looking to do internally is grow that managed-service provider part of the business, but then also take care of a lot of the day-to-day stuff, too. Three or four years ago, there weren’t a whole lot of cloud-service providers that we felt could do what we were looking to do. So when we had this opportunity to participate in the beta for the VMware vCHS, we were really excited. There was quite a bit of promise in it for us in terms of things that we felt were important, like interoperability, security, performance, and things like that. Gardner: Tell me about Melrose, the applications, the number of users, and your infrastructure. 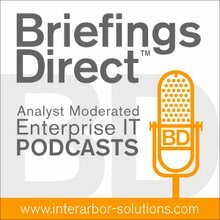 What are we talking about in terms of the IT organization? So we run quite a few different apps, many of which are obviously pretty mission-critical, and the demand is growing. We are going to be on-boarding Saugus through the summer and into the fall. So we'll be experiencing some growth through that process as well. Gardner: And Essex and Saugus are also municipalities in Massachusetts, and you have been experimenting and bringing them on, so that they become paying customers to you. Do you think it is possible at some point that you're going to cover your IT cost by doing this managed-service provider business? Pazos: Early on, it got to a point where we couldn't do it, but it looks to me like now we're potentially going to be in a position where maybe five or six additional clients get us to the point where we are revenue-neutral to the city. That's looking a little bit more realistic for us in terms of both getting people to warm to the idea and also being able to support it. Revenue-neutral would be absolutely fantastic. If you're taxpayer in the City of Melrose and you can have a department that offers all of its services internally and be completely revenue-neutral, I would be ecstatic about that. Cousens: I also think that the services we offer to the city are better because of our equipment. Our refresh schedule is better. The stuff that we're using is more enterprise-grade, because we're using it in the hosting environment and providing to a number of partners. Gardner: I suppose you could look at that as another added value. You're actually modernizing them -- or guiding them into a more optimized IT infrastructure with a higher utilization. You're also helping them decide which of their services to get from the source, in this case the one that you are managing, versus perhaps a cloud provider that would not have the expertise in the customization that they're looking for. Pazos: A lot of these are small governments scattered around the state. The $75,000 that Saugus is saving this year is very big money in small town government. Gardner: Do you have any advice for those who might be also considering adopting a hybrid cloud or maybe even pursuing the notion of being either a consumer or provider of these managed services? Pazos: Whatever you've been waiting for, don’t wait. It's to the point where you just want to move ahead, and for some of this, you're going to have to adapt and sort of figure out as you go and as things evolve.